Aesthetic tattoos is not a separate tattoo category. It’s a term to describe artistic and beautiful tattoos as a piece of art. When you were looking for aesthetic tattoos, you probably had in mind minimal and tasteful ones. Well, as Wikipedia describes, aesthetics explores the nature of art, beauty, and taste, with the creation and appreciation of beauty. A kiss tattoo on the left rib cage. Source. Aesthetic peony tattoo on the inner arm. Greek god tattoo on the left thigh. Source. Japanese-inspired wood block tattoo on the arm. Source. Julius Caesar Tattoo on the left arm by Single Needle Tattoo. Source. Mandala tattoo on the arm. Source. Red and black mandala tattoo on the arm. Source. Subtle flower tattoo on the arm. Source. So, a tattoo is not only a decoration but also artwork on your body. For your eyes, the primary goal of tattoo is aesthetics. You want it to look nice, and it will make you feel good while looking at it. Even if your tattoo will be on the back and you won’t be able to see it all the time, you will still admire the idea of having a piece of art on your body. Cloud circle tattoo on the chest. Source. Detailed eye tattoo by Sanghyuk Ko. Source. Knife with a reflection tattoo on the leg. Source. Minimalist wave tattoo on the arm. Source. Mona Liza in squares tattoo on the arm. Source. Mountain and constellation tattoo on the inner arm. Source. Osaka wave tattoo on the arm. Source. A triangle sakura tattoo. Source. Incredible floral tattoo on the arm. Source. Aesthetic tattoos aren’t something you can google and ink the first found example. As a form of art, it must be unique, and it must mean something personal to you. So, the basic concept of aesthetic tattoos is that it has to look good and also express something unique. An aesthetic tattoo doesn’t have to be tiny. It’s not about the size at all. It can be a huge piece or a small tattoo on your finger. All that matters is how it looks. It has to look good. In most cases of aesthetic tattoos, it doesn’t even matter what the tat means itself. Aesthetics looks on what impact a piece of art can have on a person. So, don’t push yourself too much if you want a good looking tattoo. Your tattoo doesn’t have to mean anything. If it makes you feel good just by looking at it – that’s it! That’s all you could want from an aesthetic tattoo. Abstract tattoo on the arm. Source. 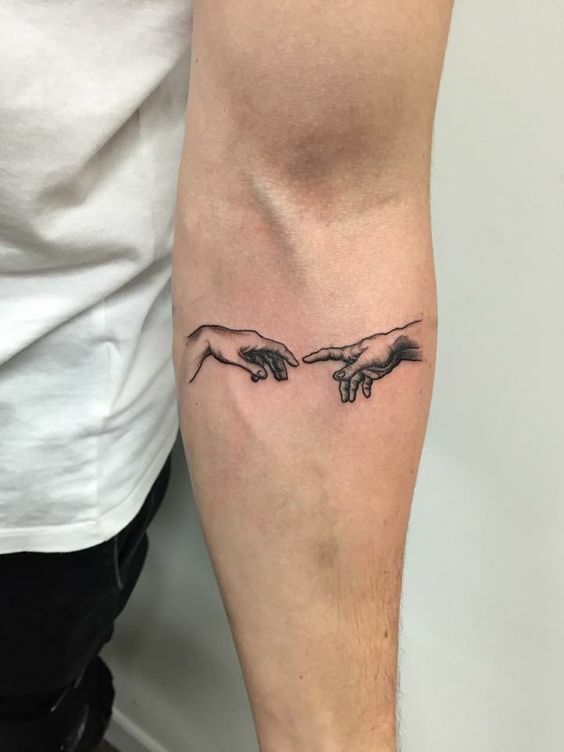 ‘The Creation of Adam’ tattoo on the arm. Source. East Asian scenery tattoo idea. Source. Maori tribal full sleeve tattoo. Source. Minimal Japanese style tattoo. Source. Minimal lamp tattoo on the arm. Source. Mountains tattoo on the wrist. Source. Realistic hands tattoo on the sleeve. Source. Rose tattoo on the sleeve by Alice Carrier. Source. Swiss cheese plant tattoo on the inner arm. Source. Traditional black tattoos on the belly and the inner arm. Source. Whale tattoo on the inner arm. Source. White snake tattoo on the hand. Source. Wildflower tattoo on the inner arm. Source. Because of aesthetics, we can enjoy art as it is without digging too much into its meaning. So, that means you can get a beautiful-looking tattoo and not worry a thing! Look at our impressive collection of best aesthetic tattoos that we have gathered from all over the internet. We are pretty sure that you’ll be inspired and find an idea for your next (or the first) tattoo. Since aesthetic tattoos are all about the looks, it should be well visible. It’s entirely ok if you don’t want to show it and keep it to yourself. In both cases, the most important thing is that it should make you feel good. If you, however, would like to keep it hidden, the best places are chest, upper and lower back, arm, rib cage, belly. And if you’d want to show your tattoo off, you should choose hands, forearms, legs, neck or wrists. Black flower tattoo on the leg. Source. Beloved tattoo on the arm. Source. Blackline tattoo on the arm. Source. Fern leaf tattoo on the fingers. Source. Floral tattoo on the inner arm. Source. Green leaf tattoo on the sleeve by Pis Saro. Source. Tiny flamingo tattoo on the ankle. Source. Victory is in my veins quote tattoo on the back. Source. Wildflowers and crescent moon tattoo on the wrist. Source. Another wildflowers armband tattoo. Source.